It is hard to beat the natural beauty of wood planters, whether it’s on a small condo balcony or expansive patio. A well-chosen planter in long-lasting teak or durable cedar will enhance any garden decor—no matter how contemporary or sophisticated. Gone are the days of having only oak half-barrels or rough cedar boxes to chose from. 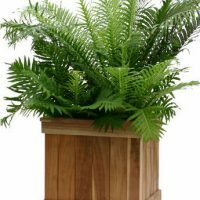 Teak planters are elegant and rich-looking, and are generally long-lasting too. Redwood cedar is commonly used for contemporary gardens because of its durability and natural resistance to rotting. Painted wood planters can be a great way to complement the exterior of your home and create a unified garden design. 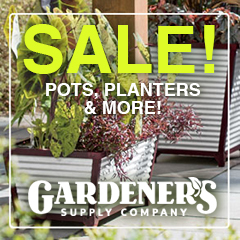 Avoid stains and sealers on your planters as these are usually toxic to plants. Plastic liners can extend the life of your wooden planters and planter boxes, or use them as ‘cache pots’ to hold potted plants and they will last longer. 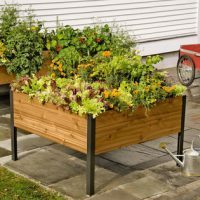 Another big advantage of wooden planters is that you ca combine features like trellises and benches for an attractive and functional unit. 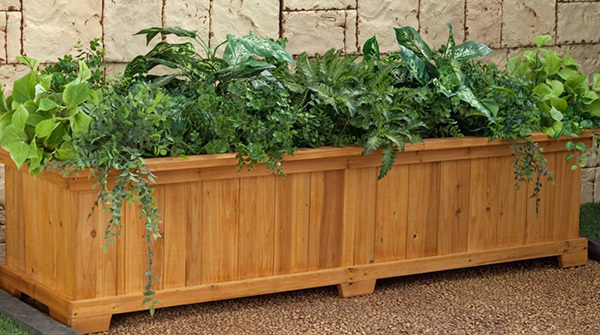 Treat wooden planters with non-toxic stain, paint or waterproofing agent. Line inside of planters that are susceptible to rot with black plastic (with holes in bottom for drainage). 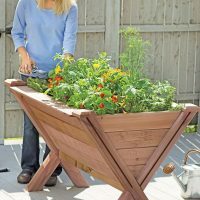 Reinforce joints of wood planters with extra rust-proof nails.